It’s a Wednesday night during the Social Season in early nineteenth century London. What’s a well-bred miss to do? 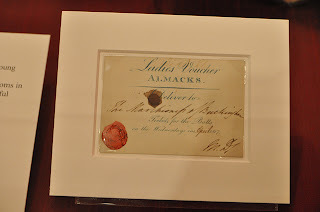 If her Matchmaking Mama has her way, our young lady would attend Almack’s, of course. 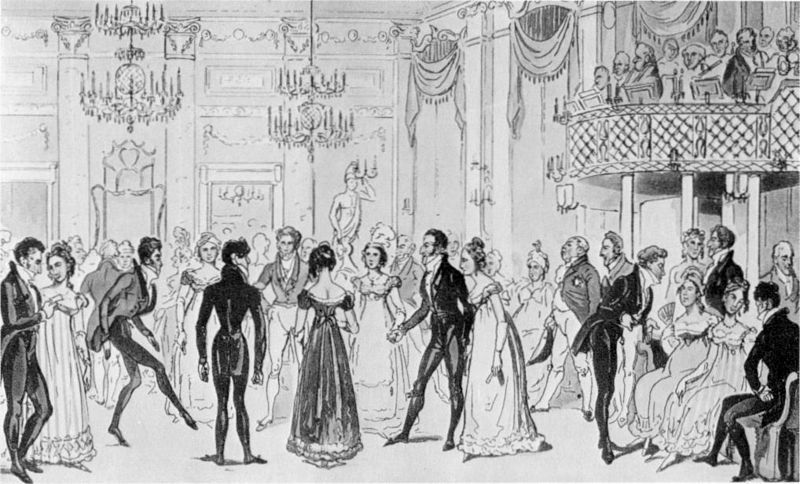 After all, that hallowed space was THE place to go to be seen, to network, to gossip, to find a wealthy husband, and, oh yes, dance--but only a select few were invited into its halls. Holding a voucher to Almack’s meant a world of difference between being part of society and being part of Society, if you get my drift. Almack's was the popular girls' table in the cafeteria, the cool kids' party. It was, as contemporary Captain Gronow put it, "the seventh heaven of the fashionable world." Almack’s Assembly Rooms were located on King Street in St. James’s, opened in 1764 by a Scotsman named MacCall. Apparently Mr. MacCall thought flipping the syllables All and Mac made for a more appealing name for his Assembly Rooms (and a coffee house, too, which eventually became the famous gentleman’s club, Brooks’s). Constructed in the Palladian style, the exterior was not as ostentatious as I’d always imagined. The inside, however, must have been astonishing. There were supper rooms, gaming rooms, and of course, the ballroom, which was some ninety feet by forty feet, decorated with gilt columns and mirrors. By 1814-1815, it was lit by gas. An orchestra played from a balcony at once end, and the Lady Patronesses—the powerful arbiters who decided who could enter Almack’s—sat on a dais to acknowledge the guests (these snooty gals deserve their own post, so check back soon). The Patronesses did not want anyone drunk on their Wednesday evenings, so liquid refreshment was limited to lemonade, orgeat, or ratafia to wash down thin-sliced bread and butter, and cake without icing. Naturally, this meant that more than a few gentlemen arrived already deep into their cups. 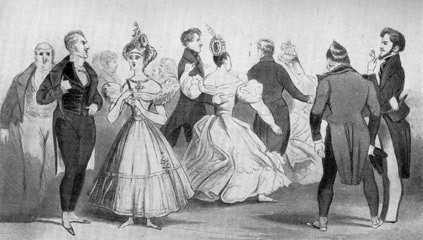 Balls were held on Wednesday evenings for twelve weeks during the Social Season (approximately March-June). No one was admitted after eleven p.m., not even the Duke of Wellington, who was embarrassed to be turned away. 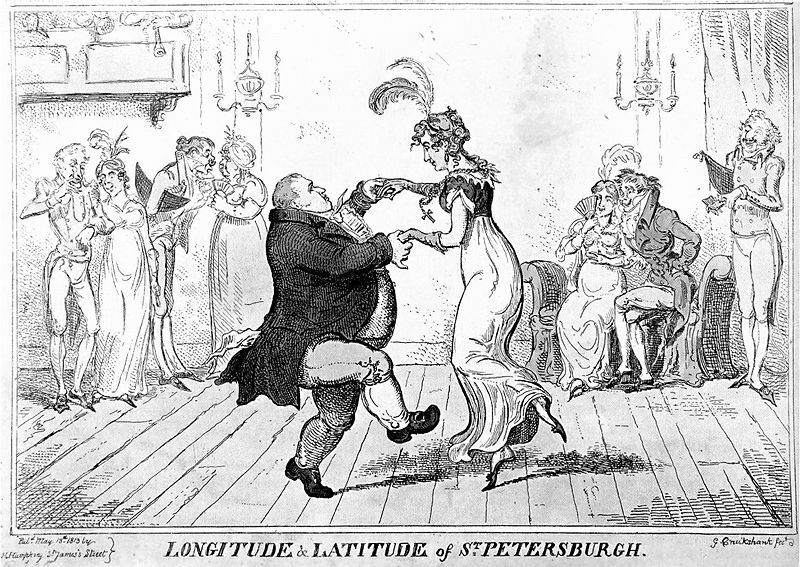 Until 1814, only country dances were allowed, but later, quadrilles and the waltz were permitted, although maidens had to receive the permission of a Patroness before she waltzed. Caricature of Countess Lieven waltzing at Almack's, by Cruikshank. Note the gentlemen in the background have chapeau bras tucked under their arms. Of course, such an exclusive place came at a price. For an annual fee of ten guineas—around £350 today—one could become a member of Almack’s. Then one would need to acquire a voucher, like a ticket, for admission, which cost ten shillings each (£17 in today's money). One could purchase a membership and voucher if one was first approved by the Patronesses, of course. And such a thing was very difficult to achieve. Connections, wealth, political influence, and prestige were all taken into account by the Patronesses when making their decisions. A real-live Almack's voucher, displayed at the Huntington Museum in California. Photo by otronto. Used with permission. Naturally, once one held a voucher, one would dress for the occasion. 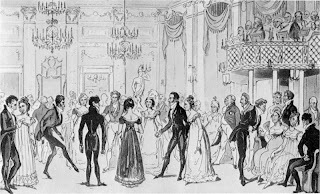 Ladies wore fashionable ballgowns, and gentlemen donned something of a uniform: navy or black coat, white cravat, black knee breeches, silk stockings or black pantaloons, worn with black pumps and a chapeau bras carried under the arm. Wider trousers or other colors would get a dandy turned away at the door! Almack’s eventually faded in popularity, and by the 1870’s it went by a new name, Willis Rooms. The building was bombed during World War II and by 1944, it was completely destroyed. Today, an office building stands on the spot, with a plaque commemorating its fabled past. Would you have enjoyed attending Almack's for an evening, just to see what it was like? Susanne Dietze began writing love stories in high school, casting her friends in the starring roles. Today, she writes in the hope that her historical romances will encourage and entertain others to the glory of God. Married to a pastor and the mom of two, Susanne loves fancy-schmancy tea parties, travel, and curling up on the couch with a costume drama and a plate of nachos. She won first place in the Historical category of the 2011-2012 Phoenix Rattler, and her work has finaled in the Genesis, Gotcha!, and Touched By Love Contests. Susanne is represented by Tamela Hancock Murray of The Steve Laube Agency. 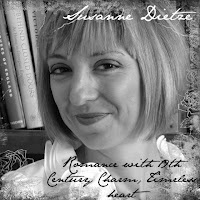 You can visit her on her website, www.susannedietze.com. I think I would have rather been a servant at Almack's so I could really be 'invisible' and not up to the social scrutiny of the patronesses. Susie, I learned so much! And I'm looking forward to more! I'd love to see it all, but I've never been one to act well under scrutiny. The more I'm watched the more I want to break out in a song and dance - you know, like the Charleston, etc. It's not that I buck authority - I quite respect it when it's something serious like the military or educational system - but High Society is not my cup of tea. Oh my. Sounds like somewhere I would be dreadfully insecure, and the Patronesses sound like they had potential to be the original Mean Girls! I am thinking we need a return to the chapeau bras (hat arms, en Francais?). My hubby is forever misplacing his hat. That was fascinating. Like the others, I'd love to see this but not be seen. I'm sure it would be amazing. I'd be happy in the corner of the room enjoying some cake. Thanks for the fun post! i'm with Deb. i'd probably be one of the "invisibles" at the service of the patrons of the place. high society stuff gives me the heebie-jeebies, but i would've liked to observe the opulance - just not experience it. very interesting post. looking forward to the one about the Patroness ladies. Deb, it would be fun to be an invisible servant...not sure if there were any females. It's funny how insipid the upper crust thought Almack's was, yet you HAD to be included or you were a nobody. Anita Mae, maybe we could have gone as chaperones, helping our charges navigate society. We'd have been ignored for the most part, but could have watched everything. I'd love to see you do the Charleston! Niki, my guess is they never actually wore those hats. Just carried them. Which would have interfered with dancing. Weird. The patronesses are totally Mean Girls! I confess, I'm looking forward to writing a post about them. DeAnna, I think part of the fun would have been dressing up. Oh, for a pretty empire-waist gown! Karl, you would have danced. You know it. DebH, if I'd been there, I probably would have stepped on my hem, stepped on my dance partner's toes, etc. Miss Misstep, that's me! Perhaps they had female servants in another room - now... you really must tell us about the toiletting accommodations. Oh wow, Deb, I will have to look into the toiletting accommodations! Sign me up. I've read enough romance novels to know that every girl who goes to Almacks ends up with a rich, titled, handsome, and nice guy. It's in books, so it must be true. You're so right, C.J. My heroines go to Almack's, and they always dance with Mr. Right, who can't help but love them. I'm afraid I'll still have to let you girls do the dancing and then when you marry the heir to the fortune, you may bring me along as your 'dear aunt' who you simply 'can't bear to leave.' There's definitely an age limit for we matrons out on the floor. 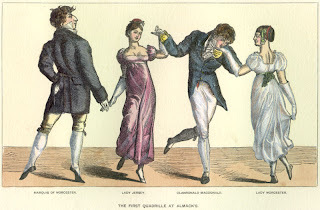 But please, as you are dancing, try to promenade close by so I can get a good look at your rich, handsome dance partner! I feel very familiar with Almack's for some reason. I'm thinking probably Laurie Alice's novels. I'd definitely love to spend an evening there. Susie, what is this: orgeat and ratafia? And how come there was no icing on the cake? I loved this post and the pictures. I would have loved to spend an evening at Almacks. Fun to learn the origin of the name. I'm looking forward to the mean girls post. All right, Dina! I can see you dancing holes in your slippers. Suzie, orgeat and ratafia are both sugary syrups that were put into punches (probably alcoholic, but they couldn't have been strong or the patronesses wouldn't have served them). Orgeat is almondy, and you can still buy it from Torani syrups. Ratafia--I think--was made from fruit kernels. I'm not sure why they served "dry" cake, but the refreshments were a bit sparse. No wonder gentlemen really didn't have an interest in going. That was great Susie. It was fun to look at the drawings too. I must have absorbed that as reading and years passed, as it was quite familiar. I can't wait to find out more about those nasty patronesses. Bring on those Regency Nazis with their quizzing glasses!